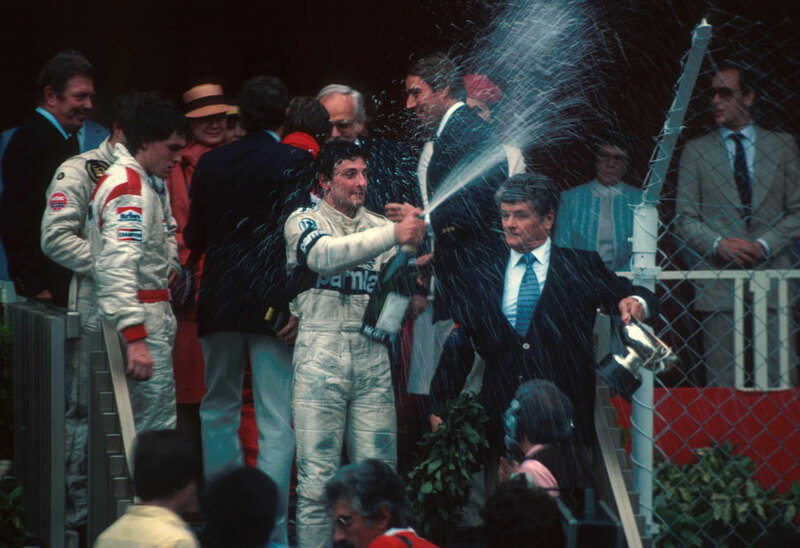 Riccardo Patrese won a Monaco Grand Prix which appeared to be a run-of-the-mill affair until light rain, spilt oil, and a lack of fuel late on turned the race on its head. Alain Prost had taken the lead on the 15th of the 76 laps after his Renault team-mate Rene Arnoux had retired with mechanical problems, and he held it until the 74th lap when he slid sideways on oil, cannoned from one set of barriers to another and finished, with one wheel detached, dejectedly on the side. That gave Patrese the lead, but it was short-lived as he spun his Brabham, allowing Didier Pironi (Ferrari) and Andrea de Cesaris (Alfa Romeo) to pass. He managed to rejoin the race after rolling downhill and bump-starting his car, but began the final lap a long way back in third - however, first Pironi and then de Cesaris glided to stops at the entrance to the tunnel, both out of fuel. Patrese passed them both and nursed his car, also running on fumes, over the line, while Pironi and de Cesaris still finished second and third. Derek Daly may well have taken the victory had he not slid into a barrier two laps from the finish - he struggled on without a rear wing before eventually stopping after losing all his gears. The Lotuses of Nigel Mansell and Elio de Angelis were two of only five cars still running at the end, and de Angelis had to be gently led away from the podium after he climbed up assuming that he had finished third. Patrese had to survive a protest from Ferrari that he had received a push start after his spin.